1. Self-adapting DC frequency conversion. 3. Extra heavy duty bearings and capacitors only found in the Kockney Koi models, for extended wear and life. 4. Suitable for fresh or sea water. 5. Omni directional hose tail exhaust. 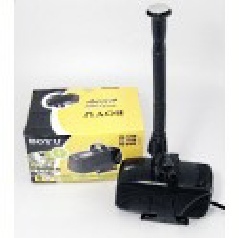 SWITCH BOXES These are state-of-the-art IP66 rated and CE approved weatherproof switch boxes specially suited for ponds, gardens, boats, greenhouses garden sheds, etc. 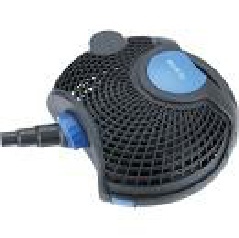 They are a must for separate switching of appliances outdoors. 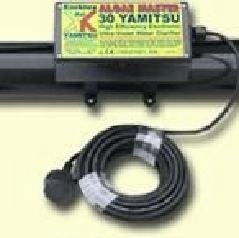 YAMITSU UV’’S - They are available as single bars units in 11, 15, 25, 30 and 55 watts, twin bars units in 15 (30 watts), 25 (50 watts), 30 (60 watts) and twin 55 (110 watts), four bars in 55 (220 watt) and six bar in 55 (330 watt). 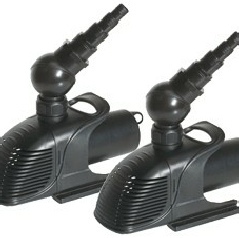 5 models including a 75 Watt UV. 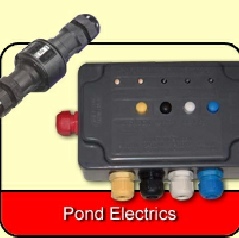 The top end 75 Watt model is designed for ponds up to 75,000 litres. The highly efficient ballast and high output 75 Watt UV bulb provides a more economical option than a traditional 110 Watt UV due to the greater UV contact time offered by the 1.2 metre bulb – ultimately saving you money. 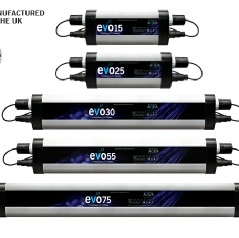 The evoUV pond clarifiers are manufactured in house by Evolution Aqua, continuing our long tradition for manufacturing exceptional pond filtration equipment right here in the UK.